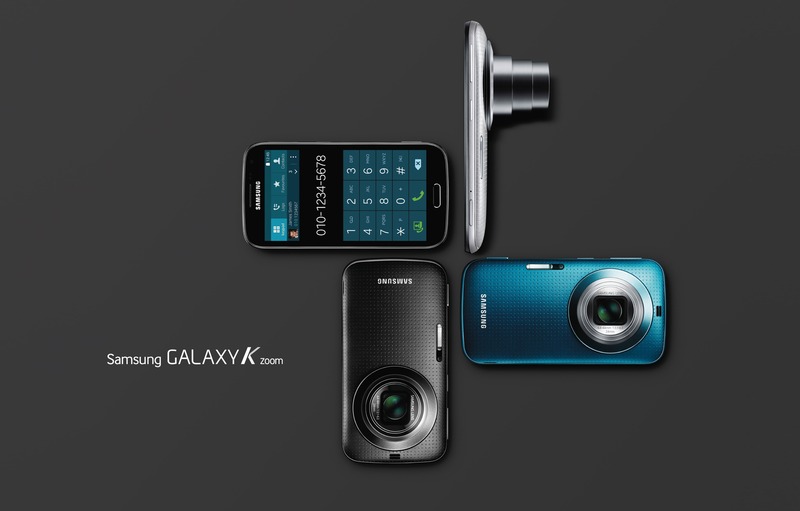 Samsung has officially announced the successor to the Galaxy S4 Zoom, the Galaxy K Zoom, which is again the same in concept – a camera in the hardware perspective, while a normal smartphone with the software part. It’s no surprise for those who checked out the Galaxy S4 Zoom last year, but for the first timers, this is the perfect combo if you are frequent traveler. The Galaxy K Zoom was announced at the Red Dot Design Museum in Singapore, and it is a full fledged smartphone with the connectivity options such as 3G/LTE (based on region) and the Android OS with all the goodies from Samsung which could impress a user who purchases this for a purpose. Samsung rarely takes a step aside from the tradition, and thus it’s the same as followed last year – the design of Galaxy K Zoom is similar to the Galaxy S5, this year’s flagship smartphone frmo the company, having the perforated design on the back while nothing much changed on the front. With the design aspect, the changes which are made, and which were totally necessary, include the dedicated camera buttons on the side, a Xenon flash alongside the LED light, beside the large 20.7MP BSI CMOS camera sensor. The Galaxy K Zoom weighs around 200 grams, and the thickness of it at the thickest point is about 20mm, which makes this quite bulky, but there has to be a compromise with the dimensions when you have the full fledged point-and-shoot camera features packed in. The display of the Samsung Galaxy K Zoom is 4.8-inch diagonally and it is the Super AMOLED display with the 720p resolution, which brings out the pixel density of 306 PPI, which is quite decent for producing neat output of the content which you capture, and many folds better than the screens which we see in the point and shoot cameras. Just like an impressive exterior, the internal specs are no bad – as the Galaxy K Zoom comes with an Exynos 5 model hexa-core SoC which features a 1.3 GHz quad-core and a 1.7 GHz dual-core CPU (Cortex-A7 quad-core, Cortex A-15 dual-core) and that is with 2GB of RAM. The storage included internally in this is 8GB, which is not fully available, but there’s a MicroSD card which could take a card of even 64GB for the expansion of storage, and a simple setting in the camera app would store all the media in the SD card rather than in the Internal storage. The Galaxy K Zoom camera is a 20.7-megapixel BSI CMOS sensor which is 1/2.3″ in size and the most interesting part, it matches the size of the sensor in the Snoy Xperia Z2, the flagship device from Sony. The aperture size is between F3.1 at 1x zoom and F6.3 at 10x zoom, and there are features such as Optical Image Stabilization to bring out the stable captures for the ones with shaky hands. The Galaxy K Zoom will run the Android 4.4 KitKat OS out of the box, and the TouchWiz UI will be layered on the top of it, but the extras you would see are the ones which Samsung recently showcased in the Galaxy S5, i.e. the Ultra Power Saving Mode, the Kids Mode and the S Health application for the fitness. For the users who prefer doing some minimal editing on the device itself, Samsung has included a pre-loaded Studio app which would assist in editing and then sharing the photos online from within the app itself. The camera app has the options for the camera mode shifting, manual configuration of the settings and the controllers for the auto-focus and the auto-exposure. For the moving objects to be captured, there’s an object tracking feature included. For the ones who are not into the professional photography, they can simply turn the “Pro Suggest” mode on so that the camera app itself picks the best settings based on the conditions around. For those who wanted to take selfies with the primary camera, the “Selfie Alarm” mode would assist in letting the user know when they are in the frame. 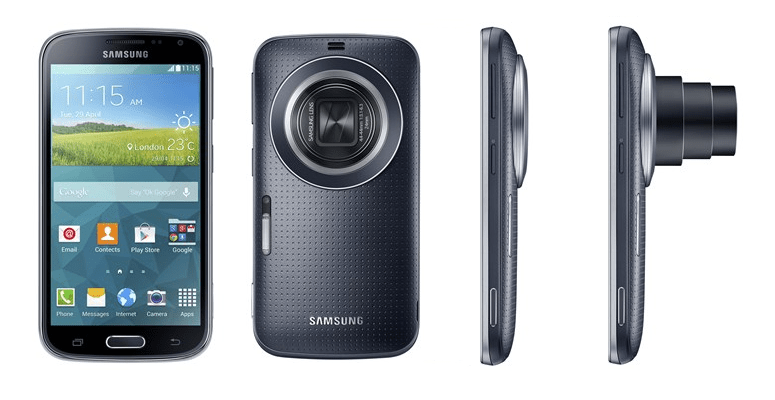 The availability of the Samsung K Zoom is dated for May 2014 but there is no word on the region and whether it would be coming through the network carriers in the US. The pricing too is not known, but it won’t cost any less, as there’s some serious internal hardware inclusion along with the external beauty. The Galaxy S5 Zoom (or Galaxy K Zoom as mentioned by Samsung) is to be priced at €519 in the Germany, and this is surely going to be a huge price if converted to USD (makes it $720), but it should be something lesser in the US, at least less than what the Galaxy S5 is priced for.